When people think of property rights between individuals, often matrimonial disputes come to mind. In Ontario, only married couples have a right to what is called “equalization of net family properties” as provided for under the Family Law Act. For unmarried couples, any right to the property of the other spouse after a breakdown of the relationship is most often obtained by way of a claim for unjust enrichment. However, a claim for unjust enrichment is not limited to matrimonial disputes. This kind of claim can just as easily be advanced in a civil litigation context. In the past, I have used unjust enrichment where disputes arose between business partners after a deal involving property fell apart. Claims of this nature can also arise between siblings involved in a family business. Often, before the dispute arose, the familial bonds of love, trust and understanding outweighed the need for documentation concerning ownership and governance of the business. Sadly, property, or its value, can cause those bonds to break apart. There must be a benefit conferred from one party to another party. For example, this can be in the form of money, the acquisition or improvement of property, or valuable services rendered. There must be a corresponding deprivation of that benefit experienced by the party conferring the benefit. For instance, if a party renders a service to another, that party has been deprived of the opportunity cost of their own time and effort. Lastly, there must be no legal basis (referred to in the case law as a juristic reason) for the enrichment. The party receiving the benefit should be be able to show why they should be allowed to retain the benefit. Such reasons can include a contract for services rendered, or the intention of a gift. If these elements are established, then a claim for unjust enrichment is proven. A court can then consider the appropriate remedy, whether it be monetary compensation based on the value of the benefit or enrichment conferred or a constructive trust (which is essentially a declaration of an interest in property despite the absence of legal title). In a perfect world, all property disputes would be avoided, or at least determined, with appropriate documentation clearly setting out ownership and any obligations or entitlements. 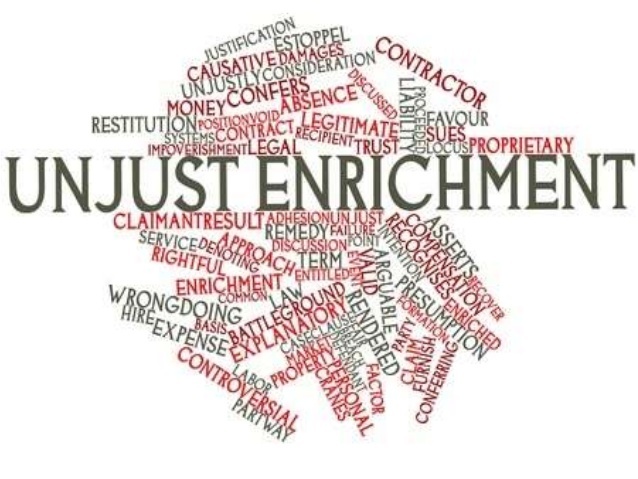 Nevertheless, in this imperfect world we live in, an unjust enrichment claim can be an effective way to address unfair or inequitable situations involving property.